Geoff Anderson back for the next installment of the Technology Marketing Center Leaders' Blog. The last two posts posited about the difficulty of measuring marketing effectiveness in this changed world, and the gap where in the past the sales team was in control of the sales cycle. This time, I will go somewhat sideways, and talk tangentially about content marketing and a little about marketing automation. First, as I mentioned in my post "Mind the Marketing Gap", the model of interaction and control in the sales cycle has shifted. In my industry, this was discounted, as our community seemed to be a bit more insular, and that drove our marketing efforts to remain rooted in the last century. However, when I began peeling the onion, and doing a real accounting of metrics, it was clear that we were fooling only ourselves. Deep in my heart, I knew this, but as I mentioned, until recently, it wasn't within my purview. Time to go a wee bit sideways. Hold on to your coffee. First, the phenomenon that is driving marketing in the 21st century is content marketing. Blogs, white papers, articles, influencers and a plethora of other forms are all in the mix. Some can be readily measured (how many times was a white paper downloaded? How many mentions in social media and the press by an influential opinion leader?) while some are less tangible (visits to your web page, google searches, etc.) yet all of them are increasingly important in the sales cycle. Second is how you curate the information that your prospects use to educate themselves. You want there to be easily available relevant information on your product or service offering. Here is where it gets somewhat interesting. The relative value of content is tied to who produced it. Prospects will view anything that is created or offered by your company lower than information they find from third parties, influential "known" entities who mention or discuss your offering will have significantly more impression than anything with your company logo on it. So anything you can do to get more outside coverage of your products and services is a big multiplier to the effectiveness. How to use these nuggets of wisdom? Make it so that when a prospect has a problem, and they search for a solution, you are found. Provide incentive to have them contact you first (with a case study, white paper, or other ostensibly neutral piece of collateral). Offer them something of value in exchange for their contact information. Then, using their contact information, send them small, targeted, personalized messages to gauge interest, and progress in the sales/decision process. Each of these interactions should involve an "offer", or something of value that you are offering for their attention. The end goal is to allow the prospect to gain access to the information they want on their schedule, and to not needlessly inundate them with messages. On a small scale, this can be done manually, and as you experiment with the process, you should do small manual efforts to figure out what is effective before bringing in automation help. As mentioned near the top of this post, there are platforms that are excellent for this marketing automation, providing the flexibility to adapt your offers to your specific business challenges, and with enough customization to handle a wide range of activities. Not much on measurement in this post, but upon stepping back and watching the changing dynamics, even in the sleepy world of high end scientific instrumentation, and the struggles that the old school marketers, and sales teams fight, it is clear that the shift in power from your marketing and sales team to the prospects demands a new paradigm in execution (and measurement) of marketing effectiveness. However, it is a great time to be in marketing. The options to provide compelling offers for this world of inbound marketing is astounding, and ever growing. Next up, I will get back to more of the brass tacks of measuring marketing. Until then, Happy Marketeering! Geoff Anderson back for installment two in a series for the Technology Marketing Center Leader's Blog. In the last post we went in to background on the problem with classical measures of marketing, around leads generated, and the (oh so much) simpler times it was rooted in. This installment, we will look at the sales cycle from the customer's point of view, and how the instinct of the classical marketing person doesn't mesh. First, I will talk about something I call the "gap". In the pre-internet marketing time, like with fishing, you cast about in the sea looking to land a live one. You baited your hook (advertised, attended trade shows, wrote articles, etc.) and waited for a prospect to take that bait. Either a lead form from a trade show, or a returned bingo card from a trade magazine, or any one of a number of points where the "lead" was captured. This started the process. Marketing or inside sales would then qualify the lead, to gauge its likelihood to bear fruit, and then it was handed to the appropriate sales person. That set in motion a months' or quarters' long fight of reeling in the fish. Like in fishing, where the fisherman doesn't give much thought to the feeling of the "fish", the sales people (as well as marketing) don't think much about how the prospect likes the forced feeding of information, collateral, and the desire to follow a scripted process. As I suspect that fish on the hook don't much enjoy the fight before it is landed, the prospects don't much like the classic sales process. Raise your hands if you at some point in the past had to give up your contact information to download a whitepaper, or an application note. Did you get added to a list? Were you contacted directly by a sales person? By email, or worse yet, by phone? I bet 100% of you have hands high in the air. So, prospects dislike the hard sell. What does this do to the sales process? With the advent of the internet, and the proliferation of information, the power in this process has shifted. Instead of sales being the key dispensary of key bits of collateral, prospects expect to be able to get all the relevant information. Instantly. Without barriers. That means what used to be a "lead" isn't captured at the start of the sales process. The prospect wants, nay, demands ad hoc access to any and all information that might educate them on the product or service they are planning to buy. When marketing is measured on lead generation, essentially a number, a count of people whom we have interacted with, their practice is to erect a gate keeper at each point of contact. A campaign with a landing page - cool, but to get what is behind the landing page, a user must enter their name, email, and telephone number - not cool. Thinking back to the number of mailing lists and the volume of marketing emails you get, you can imagine why the prospect would hesitate to enter that vital information, and will look for another competitor, or avenue to get that information. While your instincts are to grab contact information and generate a lead (that is how you're ranked at year end, after all), this behavior is a huge turn-off to the potential customer. What has happened is that instead of you being part of the early decision process, the prospect does almost all the initial legwork, evaluation against internal requirements, comparisons between different products and solutions, identifying the top two or three options before ever asking for contact. Thus, there's a long lag between when a prospect learns of your product or solution, and when they actually ask for a quote or advanced information. Conversely, when a prospect ask for contact, they have already considered your offering, done research, compared to competitors or alternatives, eliminated the chaff, and are in the final stages of selecting a product or solution. In short, they are almost at the decision point, and if you treat them like an early stage prospect, you will have lost before you really got going. This makes the job of marketing even more crucial to the sales process. No longer can we hand off the prospect to sales, and just supply high quality content to the sales team, but we have to create content that drives awareness in the prospect at the start, and then make available enough information freely for the prospect to discover, learn, compare, and decide to buy, all without ever having a specific conversation. This is very difficult for the old school marketer to accomplish. The behaviors of latching on to every customer interaction, at every step in the process, the desire to control the flow and timing of knowledge, and the overarching desire to ride herd on the entire sales process, is a tough habit to break. But, the balance of power has shifted. 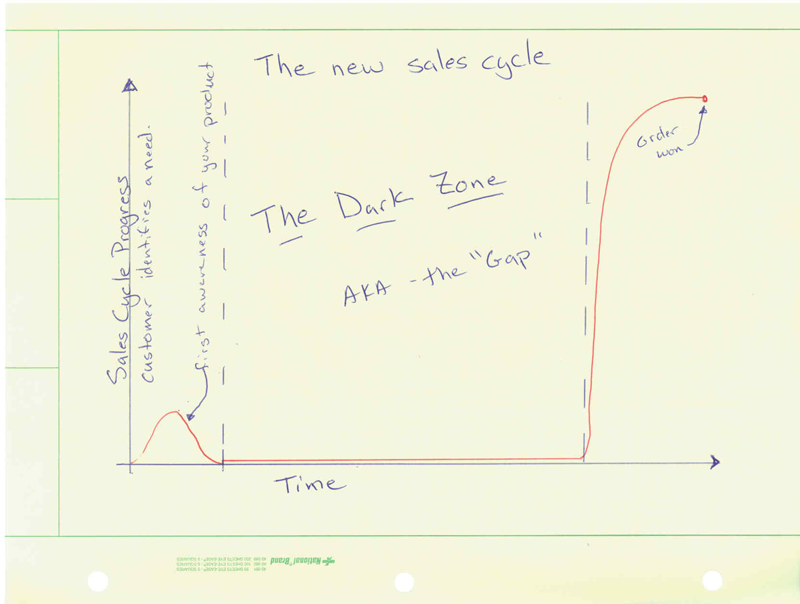 The sales cycle gap is real, and it isn't going to go back to the good ol' days. The gap requires a rethink of the process, as well as a revision of the definition of what is a lead, and how to reach those potential prospects at the start of the process. It is scary to have to put forth efforts that you can't measure, jumping into an abyss, yet if you insist on capturing the contact information at the front, you risk being in the first discard pile of products. In this installment, I have described the gap, and how we must market to people whom we don't know exist, assuming that they are looking for our products or services. While we can't see them in this gap, we can see evidence of their investigations, and infer their progress. We still need differentiated products, winning solutions, and the whole product concept is more important than ever. The challenge is how to make it discoverable by those who are searching for our products or services. And how to remove friction from their pursuit. Next up: strategies for engaging without direct contact, and influencing the decision from behind the curtain. And how the heck to capture that effort and evaluate its effectiveness. Until then, happy marketing! TMC would like to thank Geoff Anderson for his steadfast, insightful, and helpful contributions to the Leaders' Blog since its inception in 2007. Geoff will move to Emeritus status, contributing posts from time to time, and we will introduce our new Leaders' Blog author in the next few weeks. For now, here is Geoff's most recent installment for the Technology Marketing Center's Leader's Blog. When you hear the words "Strategic Marketing" what goes through your mind? Chances are, which group you report to will greatly color your perception of "Strategic Marketing"
They will think of what you can do to help them today. Find more leads, better filter the funnel, filter leads that aren't in our sweet spot. Engineering: To the development team, Strategic Marketing is often a last ditch attempt to find a market for something cool they already developed. When sales don't fall from the sky like manna from Heaven, they will fall back on some past wisdom, and think "Eureka, we need Strategic Marketing". They will bring in an expert if they can find one to try to map the technology to a long term competitive advantage. Senior Management: This one should be obvious, and often in small, privately held companies it is. Sr. Management is well aware of what marketing is and isn't. That said, the impedance mismatch between management and marketing often comes when management is looking for knobs to turn that will immediately dial up revenue and growth. Instead of focusing on what Strategic Marketing is, the identification of sustainable competitive advantages in the served markets, and the assigning of resources to exploit those advantages, they will get on the revenue train, focusing on the current and the next quarter. If all these sound more like tactical marketing, then you have been paying attention. The most difficult part of our job in Marketing is to identify, target, and exploit competitive advantages, and to stay one step ahead of the competition. To use the Whole Product to constantly be practicing true strategic marketing, as well as keeping all the other balls in the air. Existential Blues - What do you want to be when you grow up? Geoff Anderson back for another installment of the Technology Marketing Center blog. I am going to focus on a bit more of the strategy world in this episode. Every organization comes to a point where they need to figure out what they want to be when they "grow up". When you begin to expand beyond your core market segments, you look to your competitors, and wonder what is the next beach head to stake a claim too. All too often these junctures lead to indecision, and defocusing of your early intensity. The organizational temptation to emulate the growth formula followed by the market leader is strong. They got where they are by adding to their core segments, one by one, establishing a market where one may not have been before. Why can't we just match them product for product and bring the fight to them? Why not indeed. Market leaders become leaders over a long time. Perhaps they were first to market (like the leader in my industry), or they were a fast follower, with uncanny instincts as to where to place their bets next. Regardless they leave a trail of breadcrumbs that isn't difficult to follow, adding products to address markets, or developing new technologies to fill gaps, until they are number 1. While you might envy their full product portfolio, and their ability to command mindset, it is certain that you can't just follow the path they blazed to the top spot. Yet, when strategic planning, and future product strategies are laid out, all too often the leaders in your organization will look to the #1 player in your market and try to duplicate their offerings. The big mistake in this is that it is always a "me too" strategy. You are walking a path that has already been charted, and you can bet your last dollar/yen/euro that the market leader will see you and lay barriers in your path. Look for underserved markets. The market leader has size and inertia propelling them. Their scale and scope reduces their ability to react nimbly to new segments that appear, or causes them to write off smaller opportunities that aren't attractive (read: BIG) enough. Outflank them. The market leader has a huge portfolio of segments to defend. Their need to offer "standardized" products that aren't tailored to specific segments (but are good enough) leaves those segments open to someone who can put the extra effort to meet their needs. Differentiation. Large companies who lead across multiple markets do so with compromises. Often their products are neither the best, nor the right tool for the job. An astute competitor can make significant headway by developing a differentiated offering, optimized to the specific segment's needs. Caution though, if you become too painful to the leader, they will react aggressively. Orthogonal market expansion. There are likely completely new beach heads to land on that even a market leader will miss. These are outstanding opportunities to grow your reach. (an example: A company that made instruments to measure bearings in automotive manufacturing, with a simple software change was able to penetrate the optics testing market for lenses). While the temptation to follow the leader is attractive, it is risky. The Leader will see you in their rear view mirror, and react to protect themselves. 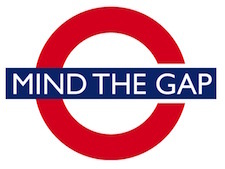 Avoid the "me too" strategies, and focus on either underserved segments, or on differentiating and beating the bigger player in a market that they are the square peg in the round hole. Of course, if you are number one, your goal to be on the lookout for the inbound attacks. Until next time, happy marketeering! Geoff Anderson back for another round of the Technology Marketing Center Leader's Blog. It is March, fresh growth is peeking out, and spring is around the corner. Must be time for Strategic Planning to begin. This time, instead of mundane and arcane process, I am going to talk about bold strategy changes, and why they are more difficult than they seem up front. First, let's set the tone. Strategic planning, formal strategic planning, is often undertaken by the core leadership of a business. Marketing brings market knowledge, and sales trends, as well as competitive insight. Engineering brings a "what can we do, and when", assessing the skills and quantity of work that can be accomplished. Finance will bring rigor to the projections, and (hopefully) some realism. Add to this mix the general manager or responsible VP who leads the process, and keeps it strategic. Nearly universal is the recognition that unless you are new to your current product/markets, the grownth potential for the business is not outstanding. Either you are bare knuckle brawling for share (great if you are in 3rd or lower position competitively, less great if you are defending against the ankle biters), or you are stuck with your place in the landscape, and look to finding underserved regions or segments to address. This is safe, but boring, low growth, and ultimately unsatisfying. Often the team will come up with a bright idea: let's do something radical, let's go after some completely new market. Often this is spurred by something that the GM/VP read, or heard among his peers (no kidding, this is how a group I worked with pivoted to focus exclusively on photovoltaics). Executive commitment - While this is commonly tossed out by a senior executive, they don't accept ownership for driving it. This is doubly true if your executive doesn't sit with the group (very common in large companies). Big, audacious strategy shifts require executive support, and engagement. Without that, they will not get off the ground. Lack of skills - Particularly if you are developing a new product or technology. While your engineering team might be fabulous at developing, extending and enhancing your core technology, odds are good that they will struggle with adding a new plank. You can work to develop those new skills (but be aware that it isn't a quick ramp), or you can acquire them (hire people with the right skills and set them up for success). Yet, often there aren't any formal adjustments to staffing and skill. There is some mystical belief that the knowledge will manifest itself. Lack of follow-through - Change is hard. People resist change. Even if everyone in the room nods their head affirmative that they agree to the new strategy, they are wondering how in the heck they will accomplish this. Marketing will look to see how engineering proceeds. Engineering will see if anyone in Marketing is adjusting their knowledge. Finance will continue to do their usual tracking, and stay above the fray. And the next planning session will come around with little or no progress, and lots of blame shifting. How can strategic realignment succeed? Strategic realignment is difficult. It is the most challenging type of change to manage, and potentially the most rewarding. Success requires consistent, strong guidance from an executive level. It will require either more resources (aka people), or resources that can do the "new" things. It will almost certainly take more than one strategic planning cycle to begin to bear fruit. Sadly, most big strategic realignments fail. Don't let yours fail. Keep executives involved, alter your organization for success (hire the right people), keep the organization focused, and don't make too unrealistic time scales. Be certain that you have executive aircover for the shift. Get the entire organization involved, from the lowest level technician up to the CEO. Geoffrey Anderson, back for a new installment in the TMC Leader's Blog. I have blogged on the trends in marketing often, and about the efficacy of the buzzword du jour, "Social Media". Today, I am going to talk about how the world is changing in the buying process and how marketing needs to "respond" to these shifts. First, I would like to recommend the book Influencer Marketing by Duncan Brown and Nick Hayes, to all tech marketers (including those who are in the communications branch). It is a concise treatise on the how the buying process has evolved with the advent of the internet, Google et. al. There are a couple of undeniable trends in the market landscape. First, customers and prospects are doing their homework. A lot of homework. Often they will use all the tools at their disposal, internet searches, online review sites, review agragators, and attempt to get at all the collateral that they can prior to their first contact with the company. If you think back to the pre-Google era, the company held all the cards. They actively sought out opportunities at tradeshows, with magazine ads, articles, and mass media/mailing. In the post-Google era, they expect to gain access to this content without the messiness of having to talk to a salesman. The other trend, and the one that is well laid out in the Infleuncer Marketing book is that early in the sales process, often before a prospect determines that they even have an unmet need to fulfill, there is almost always an influencer in the process. An industry expert, or a distinguished/respected colleague or someone who is deemed an opinion leader is either consulted, or offers advice. One thing that is certain is that this influencer is not the target customer, and that they are usually not part of the prospect organization. Thus you have no way of knowing them, and their reach. In the way back time, Sales often initiated the discussion about a solution to a lead, and was involved at each step of the decision process. Sales methodologies such as Miller Heimann, or Strategic Selling are steeped in this consultative process. But now, sales often finds that they are contacted only after the decision has been made to buy, and the list of vendors is selected. How does this affect us in Marketing? First, clear, effective content needs to be freely available to prospects just "kicking the tires". They want to be treated like intelligent adults, able to research and draw high level conclusions on their own. They know what they want, and how to define what 'it' is. Thus, the content we as marketeers generate needs to stand on its own, telling the story we want, and be helpful to as many people as possible. Second, the content needs to be freely available. White papers, application notes, case studies, webinars, data sheets and more need to not be behind a registration firewall. Customers want to be able to access all the information on their own terms. When they want to be contacted, they will let you know. This is the change that is the most difficult for Marketing Communications managers to make. Their first instinct is to collect contact information for each piece of collateral accessed, and make this a lead. But it isn't a lead until the prospect contacts you. Third, whether you are a denizen of Web 2.0, a participant on Twitter and Facebook or not, you need to establish a presence and monitor chatter on those channels. The new breed of buyer and decision maker looks to these unconventional channels not for their primary information, but to help them in their pre-selection phase to rule out unsuitable suppliers. So participation is essential. But there are other activities that are proven to help influence the prospect: Establish a blog - draft an opinion leader to contribute, and make sure that it is known. The game has changed, and those who recognize the change in dynamics are able to best capitalize on these shifts. Sales has become less consultative, and more focused around high impact, quality content that is readily accessible to interested parties. Lastly identify, and work with opinion leaders in your field to subtly influence the process before you are even thought about in the path to a solution. Geoff Anderson back in my regularly scheduled slot for the Technology Marketing Center. In the recent past I have had to do some competitive analysis, and while my case is somewhat unique, it certainly isn't uncommon. If you are in an industry that is not directly covered by one of the big analysts (Forrester, Gartner etc.) or if it is "kinda" covered, but you know that they are completely wrong, then you have to go scavenging for information. Of course, you should never do anything unethical. But, even with that limitation, there are plenty of sources of information to exploit. First, if you are in an industry with one or more publicly traded companies, you need to become very familiar with some golden fountains of information. The SEC filings (sometimes called Edgar filings) are submitted quarterly (8k), and one big one annually(10Q). Typically they are a summary (or deeper) balance sheet, and often have some comments from the leadership team. Gold is often struck there. A statement to justify some expenditure might clue you in to a new product development effort. Next, as part of the quarterly release of the financials, virtually all public companies host a conference call. 99.9% of the time these are recorded and you can listen to them on your computer. Usually, the introdcutory piece by the CEO and CFO are bland, but if there is a feisty analyst on the call, they often will get the CEO or CFO to divulge juicy details. Like how much revenue a specific division made, or comments on the strength of a specific segment (like Semiconductors). To enhance this, an online site called "Seeking Alpha" often posts the transcripts. If they are there, download them and pore over them. If there are a lot of non-public companies in your market, don't give up hope. First, there are two places to get at least first order of magnitude estimates. Zoominfo is a huge database, and virtually all companies I have researched have entries in there. Sometimes, their numbers are amazingly accurate. Alas, they seem to be switching to a pay-to-play model. If you must pay for it, then the gold standard is Dunn and Bradstreet. If you are at a modestly sized organization, it is probably that your finance team or your Investor Relations team have an account. Find out and if they do, ask for some reports. I have never been told "no". If not, beg, plead, wash your boss's car, whatever it takes to get approval to purchase a subscription. The information they hold is awesome, and since the credit organizations often consult D&B, the information is thoroughly vetted. All these can help you get a top down view. However, it is a one sided view, and often not trustworthy on its own. It is easy to fall into a false sense of security with this. You need to form a bottom's up view as well. Here you have to get crafty. First, work you network. You probably have contacts who have been there, or compete with them in non-related industries. Reach out to them for any information. Odds are good that you have some information to barter. This is also why you should never burn bridges. Second, scour your CRM. Look at win/loss order reports. What is the word on the street? If your sales team are not properly using the CRM to track these (and often they aren't) make it a mission to train them in the importance. Some of the best clues don't come out until you export and start doing some pivot tables. Keep hunting, there is good data in the noise. Third, look at your own numbers. As a marketer, you had better be keeping track of your business, and your estimated market share. Build a model. Make some assumptions. Test them. Revise and test again. Naturally, Google is your friend. There is so much information that can be unlocked if you just use the right search term. Be creative, and you will be rewarded with lots of good information. For example, if you sell to universities or government labs, your competitors bids are often public, and can be found by the bid sites. That can really help narrow down the ASP question. Of course, if there are industry analyst reports, you should obtain them and parse that information as well. In my case, I had exquiste knowledge of our largest competitors' business, since I spent 6 years there in a different division (left about 3 years ago). I was able to build a top down and bottom up estimate, and the shocking thing was how close those two were. It greatly increased my confidence in the model. In summary, a key component of marketing is competitive analysis (know thy enemy), but it can be daunting to get information that you believe. Fortunately, there are several legal, ethically clean methods to get a solid competitive business analysis. Geoff Anderson back for another installment on the TMC Leaders' Blog. Since Robert mentioned 5 key points in Segmentation for his last post, I thought I would weigh in. Unless you are really doing just a "Me Too" product, there is an opportunity to target a specific segment (if you are doing a me too product, then there are opportunities to find and exploit adjacent markets). It is not always obvious, but with experience, a marketer learns to see between the lines. Looking at the market for an analytical instrument, there is a well defined high end. Flexibility, performance, and optional capabilities define products in this space. There are three major competitors in the space, and the products start at around $300K and go up to over $2M depending on the configuration. Big, complex, and steep facilities requirements also go with this class of instruments. There is a low end segment to this product space as well. Typically a compact form factor. No facilities besides an electrical outlet and a stable workstation. But they are feature, and more importantly, performance poor systems. You can see clearly that at the high end, there is a strong set of offerings that have a strong market play. The low end, both in price and performance, is a relatively new market, and exhibits strong growth year on year. But it is clear that if you have needs for performance that is closer to the high end, you have no option but to find more budget and go big. A Voice of the Customer exercise focusing on the customers in the low end was surprising. The original hypothesis was that these customers didn't want or need the higher performance. But that was not borne out. While budgets were smaller, and the physical space constraints drove them into the low end/table top space, they were frustrated with mediocre performance, and the inability to add popular capabilities. It turns out that the segment wasn't completely satisfied with the limitations. What to do? Well, a quick course correction in our definition and development efforts drove us to a changed product. Instead of it becoming a "Me Too" in the growing, but frustrating low end space, we were able to address performance issues, and add the most demanded add on capabilities. Thus we were able to build a product that bridges the gap, providing the convenience of the low end form factor, with the performance and analytical capabilities characteristic of the high end. The savvy marketer will be constantly on the lookout for opportunities to exploit. Even in mature, long stable markets, there are often unmet needs that can lead to either a new product definition, or a re-positioning of an adjacent product. That said, you will have an uphill battle to get sales and management to go along. But, there are great rewards for careful execution. You don't always need to define a market from nothing, as most startups are wont to do.